Large baits catch large fish; it just takes a lot longer to catch one. General rule is to start big, then, if nothing is happening, go down in size. 9", 7", 6", then 4" might be appropriate. Also, plastics are typically a slow "jerk" bait, so just tap the rod up 6", then let the lure sink, and count to five; then repeat. If you count to 10, then you are "jigging" - which is really hard on the patience. Salt is what blood tastes like to a fish, so that is the reason you will see "salt-injected"; I usually go with salt and scented plastics. I have had my best luck with lures that have curly tails and provide a fair amount of action (you can see them move like prey); I have not had any luck (yet) with the do-nothing, stick-like "sluggos" or "senkos". *** Whoa! Is this out of date! Wacky-rigged senko is my #2 lure! Other lures are more fun to fish with -- you can feel the action, the wobble, the bubbles -- but plastics still catch more fish by far than all others combined. Given a hook and a plastic worm, what next? The most common answer is Texas rig, because it is simple, and, most importantly, makes the lure nearly weedless, and therefore far less likely to snag. While originally designed for vertical (up then down) presentation, it is now also used for horizontal (throw it out and reel it back). 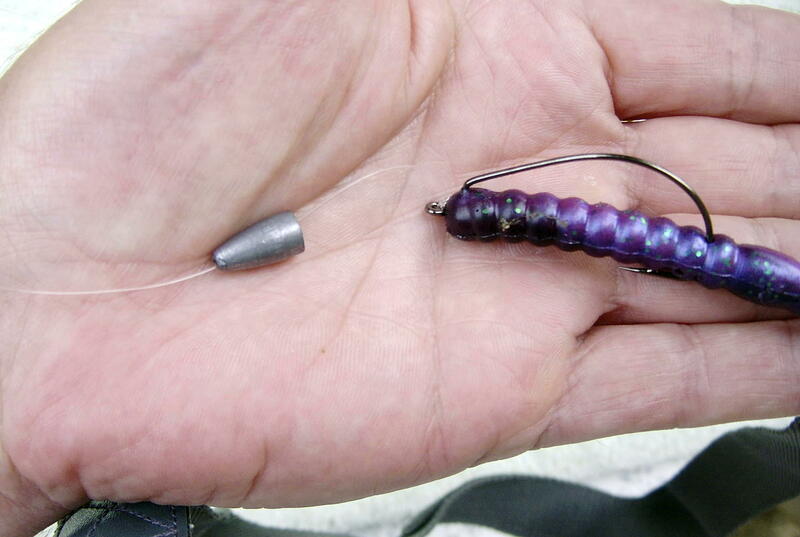 Put the hook tip into the head or top of the lure and then push the hook out of the plastic at about 1/4" from the top. Turn the hook halfway around (so the tip is now facing the body of the worm) and twist the worm so that you can press the hook all the way through. Pull the head of the lure up to -- or even over -- the hook eye and straighten the hook point so that it lays flat along the back. As long as the hook tip is lying flat along the back, it will be virtually snag-free. The following are in order of bottom-fishing, in-between, and top. Their primary feature is a "lead head" in varying shapes and sizes whose sole purpose is to get the lure to the bottom. They come with dark or white "skirts" and sometimes have a rattle attached. The brush or beard you often see above the hook is a weed guard -- to prevent the hook from snagging. One of the wonders of nature: why a bass does not immediately reject having a shaving brush in its maw. 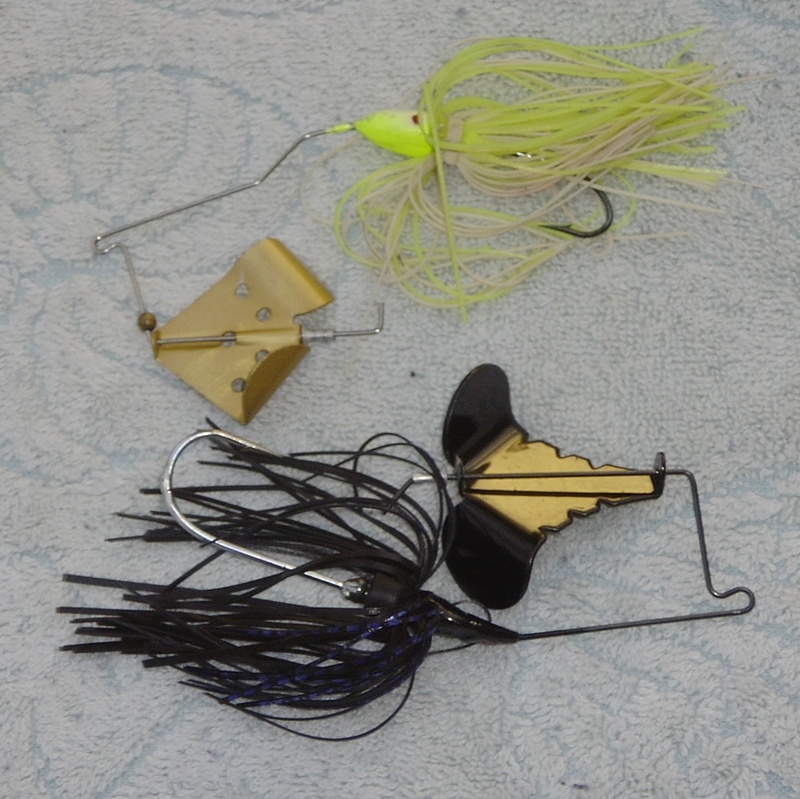 For all the effort, I have bought jigs that have everything: noise, smell, and color. Still no fish, but then I don't think I've ever lasted more than 10 minutes using them. Just too dull. 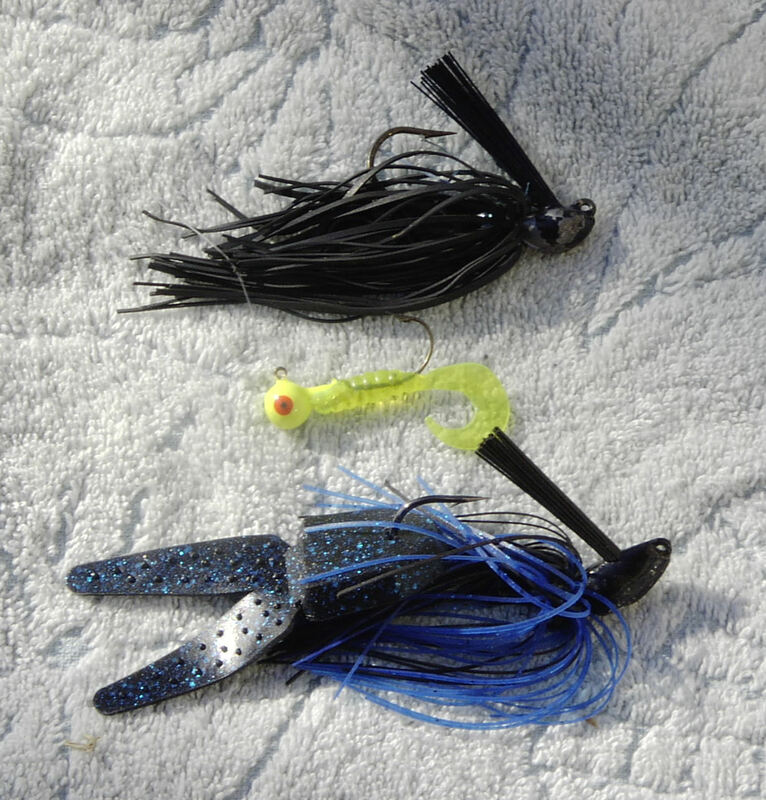 Late breaking news: I just caught two bass (11" and 13") on a "jig-and-pig", by twitching the line and reeling; so a jig will work as a slow trolling lure! Pig is short for a chunk of (salted) pork rind, but is now replaced with a plastic chunk injected with chemicals. Supposed to resemble bottom-feeding prey (crawfish, mostly). 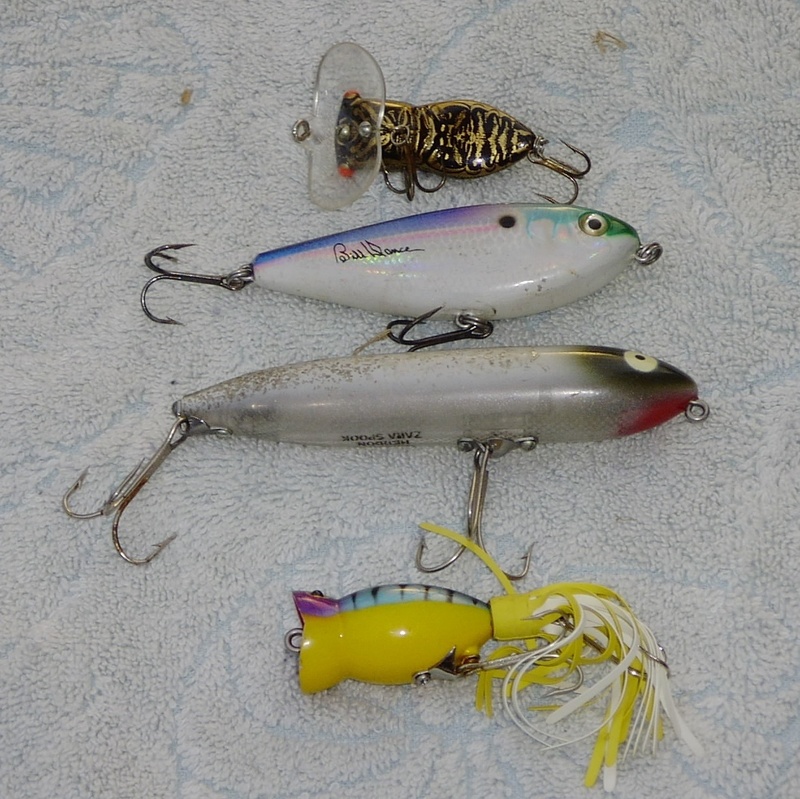 These are serious lures with 6 to 9 hook points, which is why I use a swivel to attach and not a knot. Can really mess up a tackle box unless each one has a separate compartment. Treble hooks (hooks with 3 points) are really trouble hooks. These will catch anything anytime and fish on occasion. Deep diving are intended for scraping along the bottom. Try pulling by swinging your rod back with your casting arm, then let the lure sit. It may stay where it is (suspended) or it may float up to the surface. The idea is to keep it where you think the fish are. If they are feeding closer to the top than the bottom, then use a shallow-running crankbait. Usually the bigger the clear plastic bill, the deeper it will go. The wider the bill, the more wobble - and more attention it will gather. Caught one good size bass at the Tidal Basin in Washington DC with a chartreuse skirt, gold willow blades, 3/8oz. Nothing since. Also come with a trailer or stinger hook. 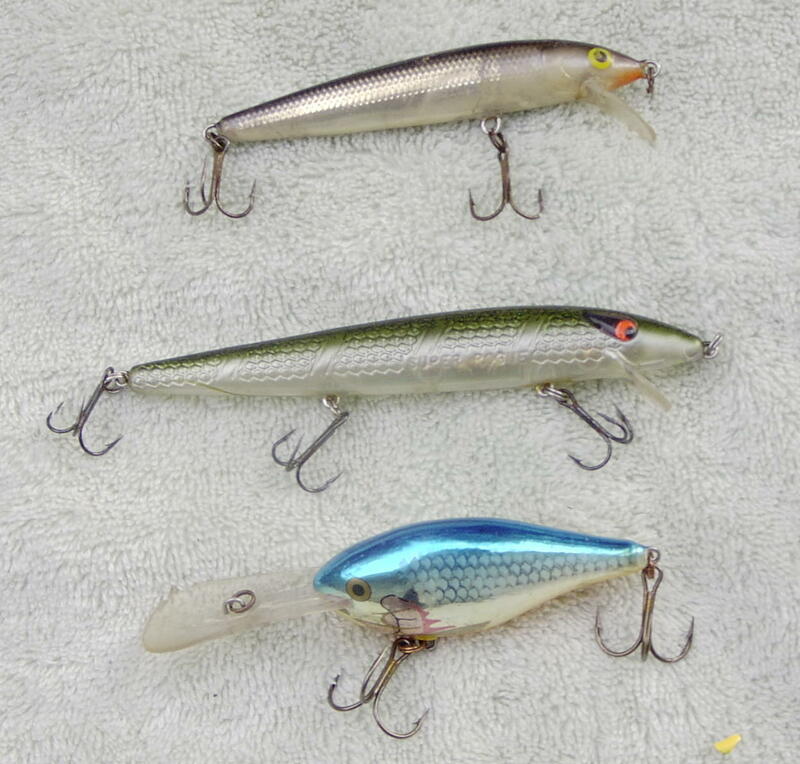 For some bizarre reason, spinnerbaits are almost expected to have a hook slipped over another hook. These are special hooks with an eye big enough to slip over the basic/original hook and are held in place with a piece of rubber tubing. Poppers have a cup-like front to them and are just gently "popped" across the water; you should just be able to hear a little gurgle. All top water, including crankbait-looking plugs -- without the plastic bill -- are considered "jerk" baits, as you jerk the line just a bit, usually in a random fashion; sometimes 3 jerks, sometimes 1, sometimes 5. This signals a baitfish that is really on its last fins. 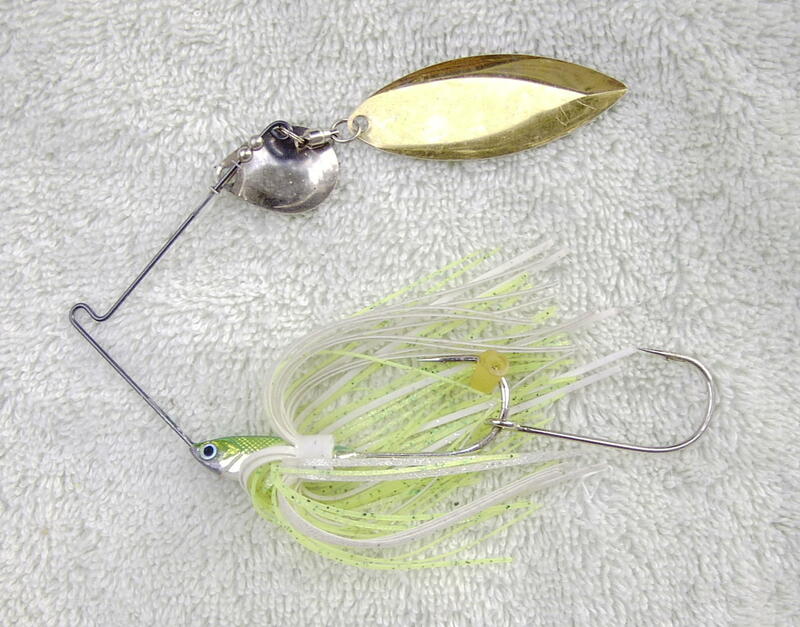 The classic topwater plug is the Zara Spook, which is pulled in such a way that it zig-zags across the water; if you get it right (with practice ...) you are "walking the dog".